Hello! Come on in! It's a pleasure today to join in again with Abi and her end of the month cuppa and chat. I hope you can smell that apple tart - there's always an apple tart round here at Halloween. I'll offer you a slice and warn you to watch your teeth. It's the tradition in these parts to hide lucky coins or charms for you to find as you enjoy a piece of pie on Halloween night. Don't worry, it's very carefully wrapped! So, what else have we got to chat about? Well, if you're a blogger, I'd be asking for advice. This post you've caught me in the middle of - I'm hoping it all goes to plan. There's been something strange in the blogosphere here lately: pictures moving around, images from here not showing up in Readers. If you read me through Feedly or Bloglovin', what can you see today? What did you see on Sunday? Is the photo there? I'd love to know. Something's not right. I know it isn't. Given the time of year, I feel like calling Ghostbusters. It's funny, I'd say if you were here, that I should be feeling so frustrated with Blogger today when I should be celebrating. Four years since I started with Shimelle's Blogging for Scrapbookers class. I can always tell when the anniversary comes round because my first ever post wished my Mum a Happy Birthday. And today I've been waiting for you to get here so that we could sing to her over the phone. See my new blue notebook? (half price, found it in Staples over the summer. We don't have Staples here and it looks like I'm missing out on Martha). I always start a new blogging notebook at the end of October. It lasts me a year exactly - with posts written out roughly, ideas for new ones. I'm looking forward to cracking this one open by the end of the week. How's that apple tart? Found anything yet? Keep eating..it's rigged, you know. The baker always slices carefully so everyone gets something. Shh..don't say a word..
What else? Let's see..we might be getting a little old for dressing up here, but we're ready for the Trick or Treaters. Did you notice our pumpkin? We painted it black with chalkboard paint and it's ready to go outside tonight. I did something I've never tried before: roasted the seeds. We tossed them in melted butter and salt and put them on a baking tray on a low heat for about twenty minutes. And, do you know what? I'd do it again. They're surprisingly delicious. here. have a bagful to eat on the way home. See you soon! And if you are out and about on Halloween night? have a good one. pictures are showing up on old reader. Your boot topper is so fancy I think wearing just one could catch on ! Ahhh we always sing happy birthday over the phone - Happy Birthday to your mum. I notice blogger messing around. I've got a link right across my blog and i have no idea how to get rid of it and i've tried! I dry fry pumpkin seeds(amongst others) and eat them warm,..yum! What a lovely visit - the one boot sock has me laughing out loud this morning! Oh this post had lots to make me smile! I can't believe it has been that long since we started the course! Doesn't time fly! Happy Birthday to your mum. I fancy a blogging notebook. what a nice idea! Thank you for sharing tea with me today Sian. 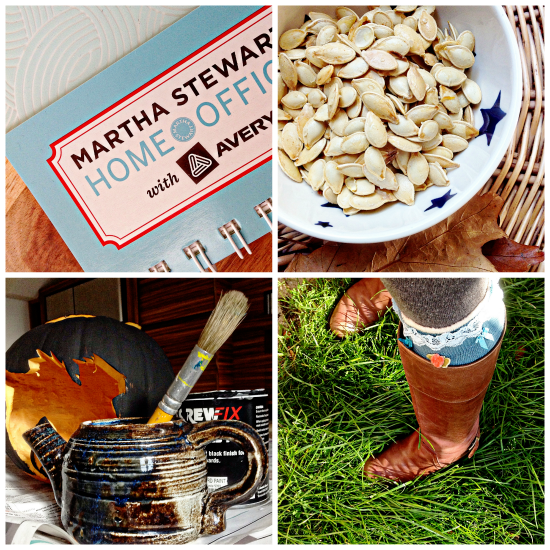 Smiling here at your boot sock story:) and enjoying those pumpkin seeds - I have only ever bought them so this is one to try. Have very much enjoyed popping in and emailed you with a pic of how your blog looks in Feedly and hope normal service is resumed for you soon. I like to think that the sock incident is a fashion statement! Happy birthday to your mum and I can't believe that 4 years have passed. Pumpkin seeds eh? Healthy AND delicious! I'm on bloglovin and you are showing up fine. I did laugh when I got to the end of the post; that's the sort of thing I might do! And you know what, I bought a postcard with you in mind today ... and it so goes with this post! You're looking great on Bloglovin...those photos would attract anyone in. What did I find in my pie? I am on the edge of my seat here! Well thank you for the apple pie, yum :) ... And just to say on Feedly, you're looking good. Your photos are showing just fine for me - I subscribe through Bloglovin. You show up fine in feedly, but can't remember if there was a photo on Sunday. I'd love it to get cold enough to need boot socks, but half a pair is a new trend! Gosh, four years is a great number, I hope you never lose your words, even when I don't comment I love reading. I see you in Feedly today Sian. Thanks for the lovely visit today. You made me laugh about the one sock/two boots. Lovely chat. I wish you all good luck with the blogosphere challenges. Lovely post and I did laugh at the boot sock mishap! That's quite a boot stocking; I don't think I've ever seen them around here. Perhaps I'm out of it! I read your blog through Feedly, and there have been no missing photos, or anything amiss from this end. No dressing up here, but we're going down to visit Skylar when I get home from an appointment tonight to help her hand out treats in her bumblebee costume. Can't wait to see her! I like the idea of only one boot sock, which I didn´t know existed! What a lovely get-together! The apple tart was wonderful, and I enjoyed laughing with you when you told your boot sock story! Looking forward to seeing you again next month! Love the sense of hospitality these posts have. I enjoy them here, at Alexa's and Alison's, among others. They do make me wish I could come visit. That's unreal that it's been 4 years since we took that course but then again when I look back at the years & Christmas worth of stories we've told each other I guess it does make sense. I've never tried roasting pumpkin seeds, sounds like I'll have to give it a go. Thanks for the laugh about the one sock. BTW, I know it's really late but I'm seeing picture ok on this on feedly.